We are about to head out to Ireland for the 6th Irish Discworld Convention. For those of you who will be attending, we will be giving a talk on the Monday morning at 10am. Do come along, we intend to make you laugh at our tales of ineptitude, embarrassment and meetings with Terry from the last 22 years of writing Discworld Monthly. It should be really good fun. 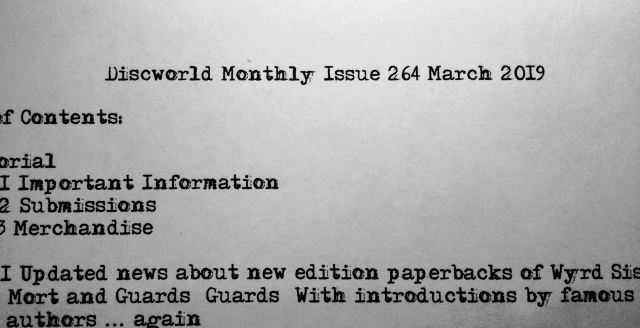 Twenty two years ago this month, Jason started writing Discworld Monthly. The first ever issue was, totally by accident, sent out on Terry's birthday in 1997. I've loved and hated the last five years doing my bit for the newsletter, it often seems like a huge task to sit and do the research and update the website / facebook / twitter / instagram and then remember to put the full information in the newsletter as well. Jason did it on his own for so long and I hope that everything I've done has helped make it a little bit easier for him and also made the newsletter better for you to read. *I want to appear like Holly from Red Dwarf, Just a head on a screen. I endeavour to find some black material, a photography background stand and a black jumper to make this happen. The deadline for submissions to issue 265 of Discworld Monthly is Saturday 20th April 2019. 2.1 Updated news about new edition paperbacks of Wyrd Sisters, Mort and Guards! Guards! with introductions by famous authors ... again! Ok, I've been harking on about these since April 2016, yes you read that right, I first starting talking about these way back in Issue 228 when Joanne Harris started the trail by tweeting that she had just finished writing her introduction to Wyrd Sisters. Since then we've had at least 4 different release dates for them and I think I can honestly* say that these are the final release dates for them as we now have cover images for the three. Currently they will be released on the 25th April 2019. *To the best of my ability to be Mrs Cake, but I'll actually believe it when I have them in my hands. For those of you who have no clue what I am talking about, these are three new paperback editions which will have introductions by Joanne Harris (Wyrd Sisters) , Neil Gaiman (Mort) and Ben Aaronovitch (Guards!Guards!) . Waterstones were the first to show the new covers and the resultant backlash from the fandom has taken us all by surprise. First up, Waterstones totally misjudged the target audience with their caption "Get ready to start collecting, Pratchett enthusiasts: three new editions are publishing in April, along with intros from Ben Aaronovitch, Joanne Harris & Neil Gaiman... "
These editions are not for the fans, I know that is a random thing to say, but they are being produced to draw in readers who have never picked up a Terry Pratchett book before because the comic fantasy covers that many of us love are actually off putting to many new readers. There are simply not enough of us "Pratchett Enthusiasts.." to keep Terry's books on the shelves of the big bookshops. As a result the publishers decided to go with something a bit more mainstream to try and draw new readers to the series. The introductions by well known authors are also meant to draw attention to Terry's works. I know many of you don't like the covers, but the negative backlash on social media is actually offputting to potential new fans, especially on a wider appeal post by Waterstones bookshop. We should all be doing our very best to #speakhisname and spread the word about Terry's books, not pour out rage on an advertisement for them. The three books will each retail at 8.99GBP each and are being published by Corgi. To pre-order yours, even if you don't like them, because we are all collectors at heart. Waterstones - Type the ISBN into the search bar on the website. ↑≡2.2 Troll Bridge European Premiere - Some tickets still available! Troll Bridge hits British waters on Monday 27th May at 1pm as part of the Carmarthen Bay Film Festival at the Ffwrnes Theatre in Llanelli. We have sent out two special editions of the newsletter this month detailing where to get FREE tickets to this momentous event which includes a special Q&A with Troll Bridge directory Daniel Knight hosted by our very own Rachel. We, at Discworld Monthly encourage EVERYONE to attend in costume to show Llanelli and the Carmarthen Bay Film Festival how wonderfully eclectic Discworld fans are. Jason will be there as Rincewind and we already know of many who will be dressed as their favourite characters too so join in the fun and come along as your favourite. How long the extra tickets will still be available for is debatable, so don't delay in booking yours. There is a Facebook event page called European Premiere 'Troll Bridge' by SnowGum Films where you will find all the details and any plans we have for a gathering of fans at the premiere. Troll Bridge has been entered into the Short Film Category and here we will get to see the 25 minute version of the film. * For those who have already reserved tickets, great news, your tickets are still valid for the new larger screen. If your tickets was for the second showing please ensure you turn up for the 1pm showing (ignore the time in your ticket and be there for the one big screening at 1pm) . For those attending the Irish Discworld Convention next week, Daniel will be attending and will be talking about the film in great detail. Currently there isn't any more news about more screenings but we do know of film festivals who will be making announcements over the coming months. And just in case you are not a Backer and you want to be. CabbageCon have announced dates and the venue for CabbageCon 6. It will be at the Hotel De Rijper Eilandern and will happen over the Halloween weekend (31st October - 1st November) . Wow, more trivia from Jason this month.. Good luck everyone. Q1. Who labels their products "The Halls of Elven Perfume & Rouge Co."? Q2. What is the name of the small child, from Sheepridge,rescued from a fire by Bill Door? Q3. What name links the Archchancellor of Bugarup University and the Fretwork Teacher of Unseen University? Q4. Who discovered the pencil bush? Q5. What is Garhartra's job role? On Saturday 23rd February three very weird sisters (and one weird brother) attended the Showtimers Production of Terry Pratchett's Wyrd Sisters (adapted by Stephen Briggs) in Nutfield, Surrey. One aspect that is always striking with amdram is the effective use of minimal props and scenery. This was a surprise to one of us, who hadn't seen this before but it rapidly became un-noticeable as the performance progressed. The Showtimers did not disappoint in their use of this theatrical style. One delightful touch was a giant painting of a turtle and four elephants that took up the entire front of the stage, so the play did indeed take place on their backs. The witches certainly looked the part, but to be honest we all felt that Granny Weatherwax too doddery which is in contrast to Pratchett's strong, upright character. While Magrat was a good mix of bubbly yet shy, Nanny Ogg could have been more vivacious and 'larger than life' in her delivery. We all loved Duke Felmet who stole the show as he descended into madness. His hysterics were, well, hysterical, but not over-acted. As with any production, there was the odd mishap, but the cast recovered with the minimum of fuss and the show went on. Overall the cast had great chemistry and it's obvious they all had a great time. The dedication to Terry at the beginning was a lovely touch and all proceeds from the raffle went to Alzheimer's Society. Thanks to everyone in the Showtimers and we look forward to the next one! We haven't had a competition for ages and as we are heading out to Cork for the Irish convention we thought we would offer one of our mugs and whatever goodies we can find from the Irish Discworld Convention to give the lovely person with the correct answer to this month's question. Q. How many Irish Discworld Conventions have there been including this year? Answers on a postcard.. We mean email us the answer and your full postal address to by Saturday 20th April 2019. Happy late March Greetings to: Chris Tarttelin, Laura Smith, Sophie Marshall, Susanne Vanden Bosch and Peter Kinsley. Happy April Birthday greetings to: Mark Dissington, Marcin Jaworowicz, Ann Mackenzie, James May, Brianna Chase, Ian Thomas, Shaun Main, Kim Griffiths, Jan Uzzell, Alan Jakus-Hughes, The Artful Nudger, Amy Kingston Anderson, Periwinkle, Grace Koscielna, Howard Legg, Loki, Purple Sue, Wraenna Reedmoon, Kate Sayer, Clare Dimmick, Sephie James, Chris Riddell, Pamela Keenan, Ben Robertson, Pam Martin, Chico Kidd, Louise Richardson, Chris Pettigrew, Reb Voyce, Hanna Stewart, Claire Selby, Kathryn Jones, Andrew Molley, Su Eriksson, Lisel Jungreithmayr, Elizabeth Lamming and Bill Barnett. And of course we need to acknowledge one special day, Terry Pratchett Day when Terry would have turned 71 years old. The 28th of April 2019 also marks the 22nd anniversary of our very first issue being emailed out. We assume any correspondence is eligible for use in the newsletter unless otherwise stated, including the sender's email address. We may edit your letters by including them using visible ink (see this month's letters) . It is vitally important that you don't pass off other people's work as your own. If you use information from other resources please let us know so we can give proper credit. You know those moving banners that sometimes are on Google homepage to celebrate a day or event? I've just found out that they are called Google Doodles and Google is happy for people to suggest new ones. How about everyone suggesting that they do a Sir Terry themes one for 25th May? With the popularity of Sir Terry throughout the world it would be great for Google to have suggestions from all over. By the way, I couldn't find a previous doodle for Sit Terry or Discworld, so it is about time. About fourteen months ago we had the builders in replacing an old sunroom. It was going to take about a week weather permitting to do and we would have to have a skip on the drive to take away the rubble etc. The builders were fine very friendly easy going my wife made cheese scones, there would be tea biscuits and we would often chat. Now not once did I mention Terry Pratchett nor did they. I have to say, I may have been a little disappointed, as I have Terry Pratchett books, memorabilia, tea towels pinned on the walls it's hard not to notice that I might like the great man. No mention from them that they even noticed. Now just before they were finished the skip was going to be collected the following morning they advised me as it wasn't full to to brim to get rid of anything unwanted. I said oh there's my wife's bike in the shed. Getting the bike out, one of the men said that's nice can I take it instead I can do it up. Of course take it. The work was done the skip was collected and the builders were gone. Now a year goes by so it's end of January this year and the builders are back next door at our neighbours. Our drives are side by side so inevitably we get to speak and catch up. The first thing (after pleasantries are exchanged) the builder says is, you know you gave my brother that bike last year. Yes of course say I. Well he sold it to a props company who wanted bikes for a scene in the new Terry Pratchett thing. What Good Omens? Yep that's it says he, I knew you were a Pratchett fan and thought you might like to look out for the bike when it comes out. Now I don't know if my wife's old bike will be in the show but I will be hopeful that it just maybe. Also I was secretly pleased to know that they had noticed my Terry Pratchett effemora. Hopefully you will find this little anecdote of some interest. This is a really long shot call for help for the Discworld Monthly readers in Hawaii, particularly Big Island. So - if anyone on Big Island happens to spot a lonely copy of the Josh Kirby illustrated Witches Abroad, with the inscription "To Jo, Oh deary, deary me...." on the inside please could they get in touch? Discworld Monthly replies: We really hope you manage to get acquainted with your copy of Witches Abroad. Just want to say that I bought myself a copy of Death's Study jigsaw for Christmas. Only started it a couple of weeks ago and have just finished and it really is super value. Difficult but not too hard even for a 75 year old. Want to know if the Librarian puzzle is still available now as it's nine months until next Christmas and I'm already suffering from withdrawal symptoms! Discworld Monthly replies: Hi Jan, I've just had a quick look and the Librarian jigsaw is still available from The Discworld Emporium..
For the trivia questions for this month, there is an alternative answer for Question 5, I believe. Letitia Keepsake may be the daughter of the Duchess of Keepsake, but Pterry had used the name before, as one of the female impersonators in the Last Continent (Darlene & Letitia, along with the female female impersonator, Neilette) . Discworld Monthly replies: Thanks for letting us know. Jason has been suitably admonished for making this mistake. Discworld Monthly replies: If we go about baring we might get barred. Getting nekkid isn't necessarily a bad thing to do! Depends on the company. A TV-Tie in mass market paperback of Good Omens is going to be available as of the 2nd May 2019. A new Large Print paperback of Good Omens in the US by Harper Luxe is on the listings for release but the date is basically a ? The Definitive Good Omens, (or The Illustrated Good Omens (no-one seems to have decided what to call it even though the cover says The Definitive Good Omens)) illustrated by Paul Kidby NOW has a release date of the 23rd May. With 12 full colour illustrations plus numerous line drawings by the amazing Paul Kidby, this definitive version of the text has had all the typos and errors corrected by Neil Gaiman and the Pratchett Estate. Coming out in a standard and a slipcase edition by Gollancz it is due out on the 23rd May 2019. It is also due out in three limited editions published by Dunmanifestin. Links below. The Definitive Good Omens is also due out in three limited editions published by Dunmanifestin. THE QUITE NICE AND FAIRLY ACCURATE GOOD OMENS SCRIPT BOOK will be released on the 31st May 2019. Dates: Sunday 14th September - Sunday 12th October 2019. Performances on Thursday-Sundays only (no performances on the 15th, 19th, 22nd Sept, 6th Oct and 10th Oct) . Brian Richardson writes: After my wife has de-cluttered our spare room it appears that I have a brand new copy of the original version of the THUD board game, still shrink-wrapped, that I would love to sell to a fan who will appreciate it more than I do. I would like 30.00 GBP for it, plus postage (or, if you live in or near NE Lincolnshire, you can collect it) . Please contact me via email ( ) if interested. Discworld Monthly writes: If *we* didn't already have several Thud sets we would bit your hand off for a copy. But we'll let one of our readers make you an offer instead. This month's issue is brought to you by sheer bloody mindedness and the letters T and B.
A3. Rincewind, the Archchancellor's first name is Bill. The UU's Rincewind doesn't appear to have any other names. 2.2 Troll Bridge European Premiere - Some tickets still available!